Here's just a sneak peek of my Mocha Monday class for April. Mother's Day is just around the corner, so this class is going to be feminine, flowery and perfect for Mom. Create three projects that will have you completely prepared for Mother's Day for only $5. How sweet is that? 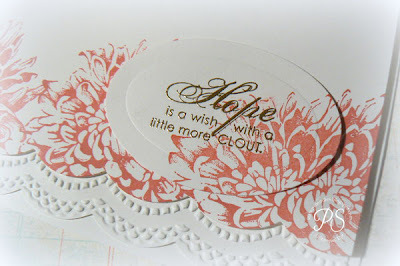 I've chosen my favorite stamp sets to use along with new techniques for embossing folders, a little gold embossing and.... well, as I said, this is just a preview so I don't want to give it all away. a morning and an evening! Class size is limited to six attendees each session. A PDF tutorial along with photos of the completed projects will be available on Monday April 15th for those that live outside the Boise area and around the world, so stay tuned.